Arthur's Pass National Park contains the most northern of the Glaciers in the South Island. The Rolleston Glacier on the southern flanks of Mt Phillistine is the most northern. The permanent snowfield on Mt Franklin is not a glacier. Throughout long periods of the last 1.5 million years, average temperatures have been up to 6� Celsius lower than they are today. This caused large glaciers to form along the length of the Southern Alps, resulting in huge rivers of ice laden with a mass of abrasive debris grinding slowly out of the main valleys in the park. At their maximum advance they extended to near Springfield in the east and Kumara in the west. Only the peaks, and highest of the ridges would have been visible above the sheets of ice. Much of the basic shape of the parks land today is a direct legacy of the last major ice age, shown in deep straight U-shaped valleys (Edwards Valley), high cirque basins (Lake Mavis, Sally & Anna), narrow rocky ridges (Philistine - Rolleston), horn shaped peaks (Mt Franklin), ice smoothed bedrock (White Valley), hummocky moraines, and flights of terraces (Craigieburn Forest Park). Most of our glaciers are either retreating (melting faster than they form), or static in size. Most would be termed "hanging glaciers", which means they are situated on the faces of mountains, or in high valleys that terminate in high cliffs, dropping into a "U-shaped" glacial valley. Most of our glaciers are small in area, the largest being the Marmaduke Dixon Glacier (2.25 sq.km) on the side of Mt Wakeman in the southern part of the park. The closest and most accessible glacier to Arthur's Pass Village is the Crow Glacier, situated on the southern face of Mt Rolleston. It is easily viewed from the summit of Avalanche Peak. A glacier is for all intensive purposes a "river of ice". It flows just like a river, however its flow-rate is extremely slow. The fastest of glaciers in New Zealand is the massive Franz Josef, it flows at a rate of 2 metres per day. Our glaciers are somewhat slower, with the Goldney Glacier moving at only 2-3cm a day. This is the very top end of the glacier. It receives the heaviest of snowfalls, and provides the material & pressure required to make the glacier "flow". The NEVE of a glacier is usually encircled by rocky cliffs. Where the ice flows away from these cliffs, the gap that forms is known as a BERGSCHRUND. These can be extremely deep, some penetrating to the very base of the glacier (this can be 100's of metres). These cracks in the surface of the ice form when the glacier flows over convex rock strata in the valley floor. As the ice-pack flows on they eventually close, a new crevasse will always form in near enough the same location. 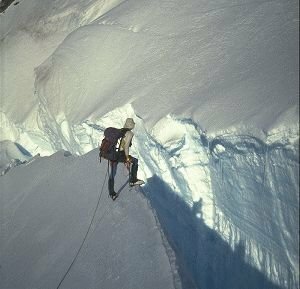 Most crevasses are no deeper than 30-50 metres. In winter they are bridged by new snow, making their detective difficult and travel on glaciers somewhat hazardous, especially in early Winter & late Spring. Where the glacier flows over a bulge in the underlying valley floor, or over a cliff, the ice folds and cracks, forming SERACS (pinnacles of ice) which eventually collapse and fall. This is the most dangerous part of a glacier because of its unpredictibility. This is the nose or snout of the glacier (the bottom end), in some cases it is an icefall (as above), or it can form massive lakes. Invariably this is the point where the glacier has met its climatic match. If it is melting faster than it can flow it is said to be RETREATING, however if the flow is great enough to overcome the melt, the glacier is forging its way onwards and is said to be ADVANCING. A stream or river generally flows from the terminal face of ice. As the glacier flows down a valley, the sheer weight of ice / snow is enough to grind the bedrock into a pulp, this mixes with the ice and is transported down the glacier. The mountains and ridges that flank a glacier are always being eroded by weather, and with this huge amounts of loose rock & debris finds its way onto the surface of the glacier. The glacier in this case acts as a huge conveyer belt, shipping all this debris to the terminal. Seasonal advances and retreats of the glacial ice bulldozes this debris into terraces and high lateral ridges. Occasional huge rocks transported by the glacier are dumped in precarious positions, and are termed ERRATICS.